Nike will be once again expanding their VaporMax series with the debut of the VaporMax Gliese arriving in a Metallic Field, Black, and White color scheme. This iteration features a Black and White zebra-like mesh upper with Gold leather overlays. 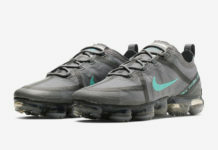 Bold tongue tab that reads “Nike Air” with mini Swoosh atop a White midsole and clear VaporMax sole unit completes the luxurious design. Look for the Nike VaporMax Gliese “Metallic Field” to release on February 2nd at select Nike Sportswear retailers.